This is a mileage app pure and simple so if you claim mileage for your business then this is a great app for you to use as it is super easy to use and will ensure you get 100% of the mileage you are entitled to. It works by tracking all your journeys and then you swipe left for personal journeys & right for business journeys. Then it calculates all your miles for the month at the UK mileage rate (45p if you are driving a car, note only 15p can be claimed for a leased car) and each month you can send a quick pdf report to your email to claim the mileage. It really is that simple and it’s quite clever in that regular trips can be auto classified such as the school run in the morning and leaves you with the rest of the journeys to classify. The other great news is it’s completely free with Microsoft 365 as they own it. If you don’t have MS365, the price is £44.99 per year but we have a discount code of 20% – Promo code: AMAL527A and here’s how to redeem it – https://bit.ly/2z0Ft8U. 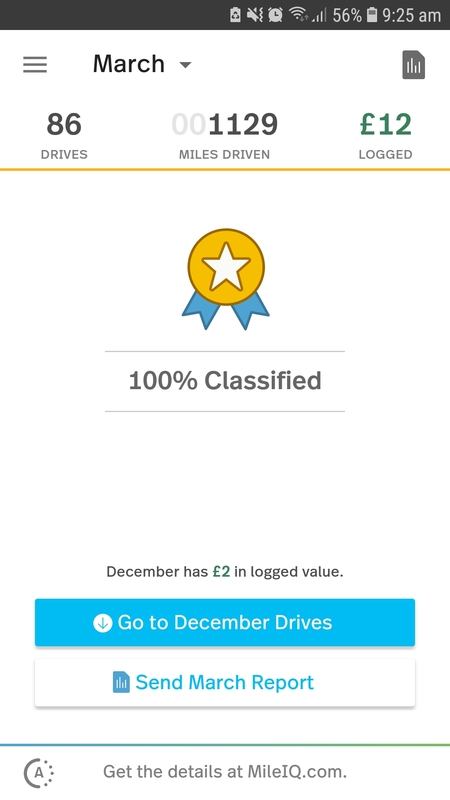 I’ve been using it myself the last 3 months and I think it’s fantastic and will pay for itself over a year in the time it will save doing your mileage claims (say goodbye to spreadsheets!) and missed journeys over the year. I couldn’t believe how easy this was to use, how quick you could transfer money and of course how much money you could save if your business has transactions in different currencies. To convert £1000 into € not only will you get the mid market rate which is what you find when you google the currency rate, but the fees when I have written this blog post are £3.66! Compare this to any high street bureau to change or you own bank and just see what the difference is. Not only that but it can be setup in a matter of hours unlike one of our clients who had to wait 13 weeks to get a Euro account setup in Dundalk! Final cherry on the top for us is the Xero integration as it can integrate the Transferwise bank account into Xero and all transactions are imported in real time the next day into Xero accounts software, so no more downloading bank statements & having to get them into Xero manually! They are regulated by FCA also. One of our clients has already told me he saved £200 on one transaction which is a fantastic result! You can sign up here and get your first £2000 of transactions with no fees – https://transferwise.evyy.net/c/1333947/586277/985. This is a software application for managing your team – rotas, timesheets, tasking, clocking – all those features are covered within a really easy to use and great looking user design and experience. It doesn’t cost the earth either at £2 per user per month and has some really good features such as employees having the Deputy app on their phones and they can clock in and clock out, you can also open up a rota shift and push that out to employees to see if they want to take that shift. It is used by over 16,000 businesses worldwide and some major companies there too so you can be assured the support is excellent and the software is regularly updated. It can integrate with Xero payroll also allowing seamless link from timesheet software to payroll, saving time and of course money in the process. It’s an ideal software solution for retail business and hospitality but I’m sure there are many more businesses and industries that could use it. Get in touch with us if you want more information or to setup an account. This allows your business to take control of company spending and save time and money in the process. It allows the business owners to eliminate overspending at a business-level and manage company expenses before they happen with bespoke budgets, limits and rules by user. You can see company spending in real-time across your business, by employee or cost centre so no waiting a month later for a credit card statement. And it streamlines expense reconciliation and reporting with in-app receipt capture, notes and tagging. Finally, you can avoid the high cost of handing out corporate credit cards by using Soldo cards with free money transfers, no transaction fees and low FX rates. We have a preferential rate with our partner programme so please contact us for more information. I’m sure there are other apps out there for all 4 of these solutions I have highlighted, but I’ve tried to select the ones that I have used and think are worth recommending. Please let me know if you have any queries or if you have used them yourself.